Toy trucks have gotten a lot more detailed than when I was a kid, at least when you’re talking about the German ones. The number of separate parts that make up the cab of this truck and the quality of the look rivals “display” models from my childhood. This is honestly why I fell in love with the Bruder trucks. While they are clearly toys, and built for durable play, they are also really nicely rendered replicas of their 1:1 scale counterparts. The only deviations tend to be the additional of handles/levers/etc. that allow them to be played with more easily(like the one on the top of the skid-steer bucket). And how about this? The inside of the opening doors have a separate door panel. By my count the door of this toy has six separate pieces. Bruder trucks aren’t cheap(before it was discontinued this was a $50-$60 set), but they are definitely worth it. In addition to the Cat skid-steer, this set came with some cones & barriers, but those are off in a drawer somewhere. In addition to the drop sides, if I recall the bed of this also tilts like a dump truck. 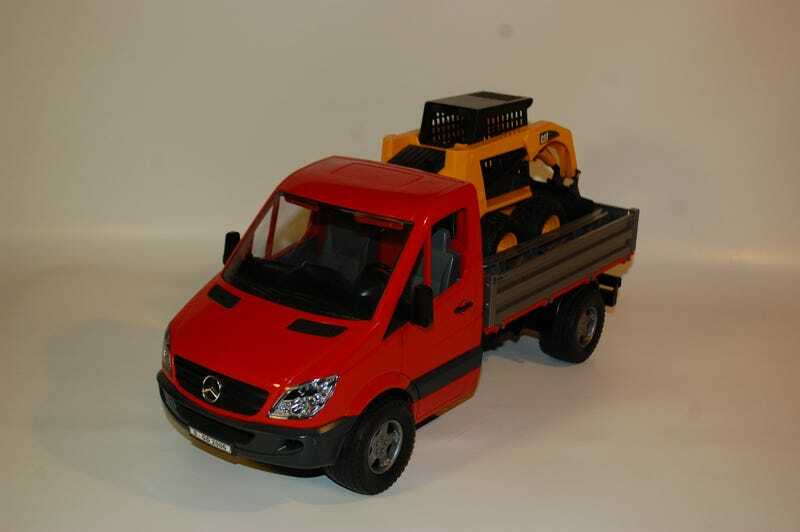 And this is just one of the variants of the sprinter they sell. Here is another, a flatbed tow truck. This thing came with a sort of CJ looking jeep, but it was kinda crap, so into a drawer it went. The cabinets on the sides of the bed open, giving you a place to stash the wheel chocks, and wheel ramps slide out of the back of the bed for loading. While it is a little less convincing in person, they did a nice job of giving the ramps & bed a treaded surface. I also like that they provided multiple holes for the wheel chocks to fit in, so you can fit whatever size vehicle you need to haul. Like this Bburago Mini cooper for instance. Tying to set up this shot I got a bit over-eager trying to pull cable on the winch and managed to jam something. Fortunately Bruder actually sells spare parts for these things, so one broken piece doesn’t mean the toy is junk. This has actually allowed me to buy some “busted” trucks cheap and fix them up for my fleet for a fraction of the cost of new. The only part of this truck I’m really not happy with is the light bar. It is actually a “light & sound module” that has multiple sounds(engine, horn, siren) and flashes the lights for some of them. The module itself is nice, but looks badly dated on these newer trucks. Given it can be popped right of(a hinged flap covers the hole in the roof when it is removed) it is a minor gripe, and I’ll likely be making custom LED light bars down the road. Next time, I veer away from Bruder again for some 1/18 scale camping action.